The technology sector come into focus in the second quarter of 2017. At the same time, the end of the “Trump Trade” we spoke about in our first quarter commentary continued, with cyclicals lagging the rest of the market. 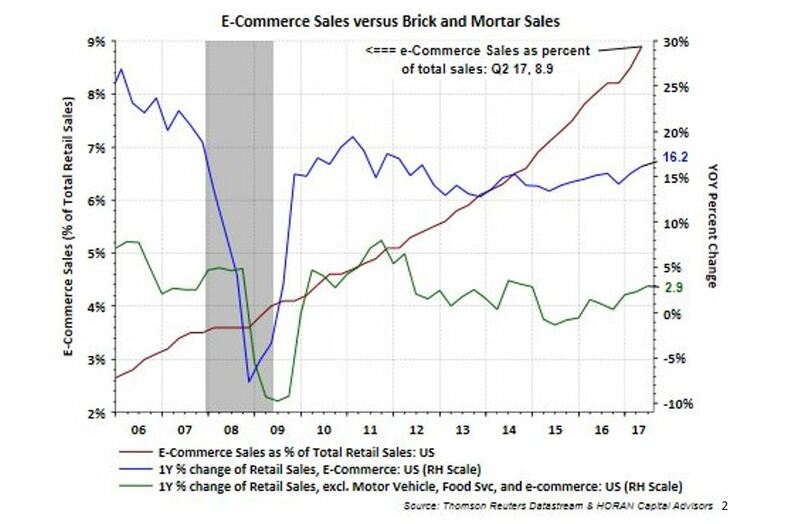 As investors aggressively shifted portfolios towards technology, they also moved money away from anything remotely related to the mall-based retail economy at an accelerating pace. Two-sided networks—these companies all unite sellers of goods or services with consumers, at a scale that is on the one hand, large and defensible, and on the other, very lucrative. Capital lean—these networks require very little incremental capital investment. There is little CAPEX needed for either maintenance or growth. Most of the actual investment flows through the operating line (R&D in some cases, marketing in others), thus actually suppressing what we believe to be the true long-term earnings power of each of these businesses. High margin businesses—despite investment flowing through the operating line, these companies generate substantial operating profit margins and/or have the capacity to ramp these margins as the businesses further scales top line growth. Further, each incremental customer who buys or a good or is serviced on these platforms has very little incremental cost to the platform itself. As such, revenue growth has two effects: 1) the ramp of growth itself; and, 2) an upward pull on margins. We listed the companies and summed up the opportunity as follows: “Collectively, we think of them as dominant business and commerce platforms for the future, with proven business models, robust cash flows and large growth runways.” Since that time, we have only added more exposure to this uniquely modern style of company. These positions have paid off nicely and due to the large growth runways, have ample opportunity to continue to do so. Companies that are natively vertical, with a differentiated, high-quality product have an inherent advantage. The world where big box stores could compete on a combination of location, well-curated products and generally (though not universally) low prices is entirely over. Distribution and convenience are important challenges online, but can be overcome with some combination of low prices, premium quality and exceptional service. It would be appropriate and well suited at this time to thank our terrific 2017 Summer Analysts, Ryan King, Joshua Herman, and Robert Palmer for their intellectual curiosity and diligent analysis. Each contributed tremendous value to our research efforts. Because of them, we can enter the second half of the year with a deep understanding of retail replete with an extensive watchlist of promising investment opportunities. We have yet to get aggressive in the affected areas of retail, but we did commence our positioning in the space. Valuations are cheap, but the risk of being wrong (or early) is perilous. Moreover, since nearly all these companies are priced quantitatively at valuations predictive of outsized gains, ultimately being right on investments in this space comes down to qualitatively determining the companies best positioned to succeed. As Buffett apparently said, “my greatest investments weren’t mathematical, they were unique qualitative insights.” We are quite confident that will hold especially true here. We did take a starter position during the second quarter that has subsequently been increased to a more substantial size in one retailer whose characteristics embody what we are looking for: Williams-Sonoma (NYSE: WSM). Williams-Sonoma is unquestionably cheap, trading at a mere 5.5x 2018 consensus enterprise value to EBITDA. In the depths of the crisis, the company traded at 4x forward EBITDA, but outside of the November 2008-January 2009 period, the company has traded in a range between 5.5x and 11x EBITDA. While many associate the company with its namesake brand, William-Sonoma’s largest driver of earnings is Pottery Barn. As of next year, Williams-Sonoma the store will be the third largest source of revenues behind Pottery Barn and the fledgling West Elm brand. As evidenced by the valuation, investors right now are lumping this company in with “mall-based retailers” considering all its closest comparables are just that. Upon closer inspection, it becomes apparent that Williams-Sonoma is a different company than meets the eye. While the brand is often associated with its mall-based footprint, nearly 52% of its revenues are generated online, with over 72% of its operating income earned via the web despite furniture’s status as an especially under-penetrated area online (only 10% of US furniture sales happen through the online channel). We suspect this is so because many people still like shopping for furniture in a way such that they can see and feel the quality and comfort of what they are buying. Stores thus provide a natural showroom. Moreover, William-Sonoma’s furniture brands use stores as a springboard for a high-touch retail offering that other natively online retailers (like Wayfair) cannot compete with. Specifically, the stores create a national footprint of designers who are positioned to help customers plan their layout and present and future purchases to furnish their homes. Ramped capital investment to handle new distribution and foster greater convenience for customers. The company’s history in the mail-order catalogue business is an advantage in how it afforded management the opportunity to leverage the catalogue’s lessons learned and distribution footprint immediately into a distribution advantage online. This is as much related to the company’s physical capability to handle a large volume of online orders as it is about the company’s culture being geared towards driving sales irrespective of channel, with processes in place to fulfill customer needs and orders. Beyond that, management has proved adept in understanding changing tastes and trends, having built West Elm from scratch starting in 2003 to a $1b run-rate brand, all amidst the backdrop of this larger shift from retail to technology that we prefaced this company feature with. West Elm benefits greatly from leveraging Pottery Barn’s existing distribution infrastructure and lessons learned in capturing customer mindshare online. All of the unique brands at Williams-Sonoma the company offer high quality products that the brand stands behind. Pottery Barn and West Elm in particular are natively vertical, with differentiated aesthetes in furniture. We think this is important, because people who buy into a particular aesthete, expectant of a certain level of quality and comfort, will be increasingly likely to make additional purchases from the same brand. For those of you who have enjoyed reviewing our investment presentations in the past, we have a special treat for you. Elliot Turner was again honored to present at the 2017 Value Conferences Wide Moat Investing Summit. He presented IMAX at the inaugural event four years ago followed by eBay/PayPal in 2015, and Envestnet in 2016. At the Wide Moat Investing Summit, recognized value-investors presented some of their best investment ideas. Elliot presented on Twitter and his slides can be accessed here. This entry was posted in 2017, Commentary on September 5, 2017 by RGAIA.